Ancho Chile Salsa (or Relish, or Pickle, or Viniagrette)! This marinated salsa – more like a pickle or relish – is sweet, mildly spicy, and beguiling. It is a very versatile salsa, too, as you can use it like a regular salsa and spoon it on top of any kind of antojito, like tacos, quesadillas, and even scoop it up with chips. It can also act as a luxurious relish for grilled meat, chicken or seafood, not to mention paninis, tortas or hamburgers. You can also use it as the surprising final touch on crostinis with a base of goat or fresh cheese, or cherry tomatoes… And these are just a few options. I am so crazy about it, I can eat it like candy. I even said so below… (right after I showed you how to make it). Yet, one of my favorite ways to use it is as a chunky vinaigrette on top of your mozzarella and tomato salad or over a grilled romaine and red bell pepper salad that I dreamed up with this ancho chile salsa in mind. That is how I used it on one of my PBS series episodes, where the video clip I just shared with you comes from and got a fabulous response. However, I realized after reading some of the messages like the ones below…. …that the Ancho Chile Vinaigrette (or Salsa or Pickle) should have been a stand alone recipe. It deserves its very own post. The main star of this salsa (or pickle, or vinaigrette, or relish…) is the ancho chile. A dreamy and spectacular ingredient in its own right. Making it is so easy, simply stem and seed the anchos and cut them with a pair of scissors (that is why in some northern states versions of it are also called Salsa de Tijera). Mix it up, and let it do its thing… After 8 hours, you can store it in the refrigerator, and it will last as long as you have it there to finish it up (ok at least 6 months…)! I usually add everything to a glass jar; the same one I am going to store it in. I then shake it up, close it and place it in the refrigerator. I made it in this red casserole, just to show the steps… Whichever method you choose, I promise it will be worth your while. Using kitchen scissors or a sharp knife, cut the stemmed and seeded chiles lengthwise into thin strips and place them in a mixing bowl. Add the onion, garlic, vinegars, oil, salt and sugar to the bowl and toss to mix well. Transfer everything to a container with a tight-fitting lid and refrigerate for at least 8 hours before using. I just got back from a month in Oaxaca, our annual “flee the winter cold” trip. Came home with five packets of dried chilis so am now looking for recipes for them. My question is are the Ancho chilis is this salsa dried or fresh? If they are dried then I have a use for the package I brought back. And if the are fresh can you direct me to a recipe for dried ones. Thanks. Love your shows and how you unpack the complexity of the Mexican cuisine. How fun, Joyce! 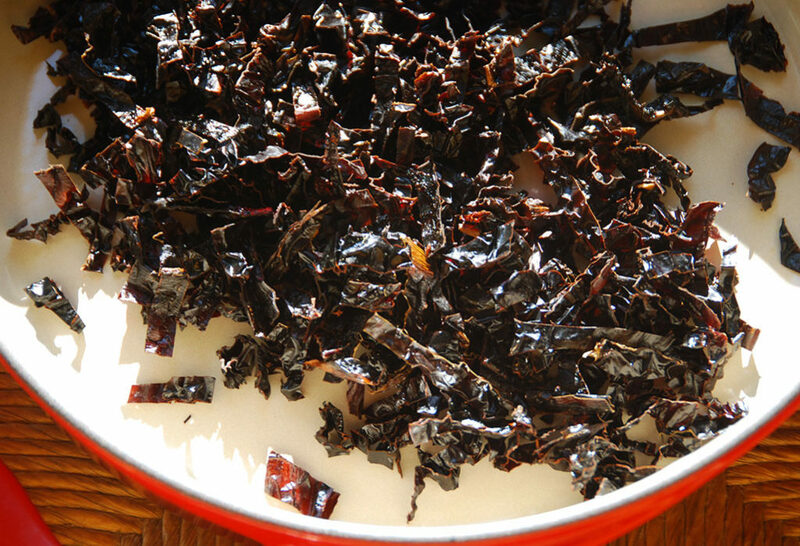 The ancho chile is dried. Here’s some more info on them: https://patijinich.com/ancho_chile/ Enjoy all of the chiles you brought back! We love this salsa. We really do eat if right out of the jar. 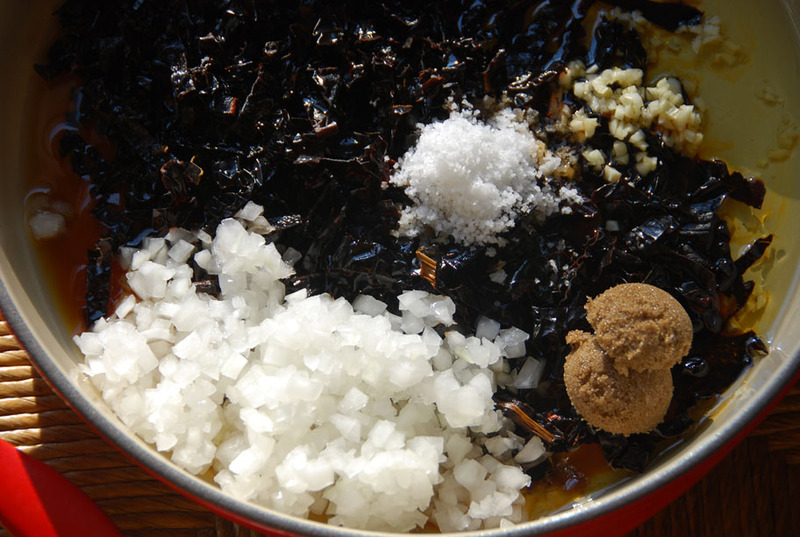 We had it on our venison sausage breakfast burritos and last night we added it to our bowl of ancho and adobe chili. I was making cornbread muffins to go with the chili and asked my husband if he wanted fresh jalapenos in them and he said “what would Pati do”. You’ve become our go to for recipe inspirations. Oh I’m so happy to hear this, Paula and Kevin…thank you so much! 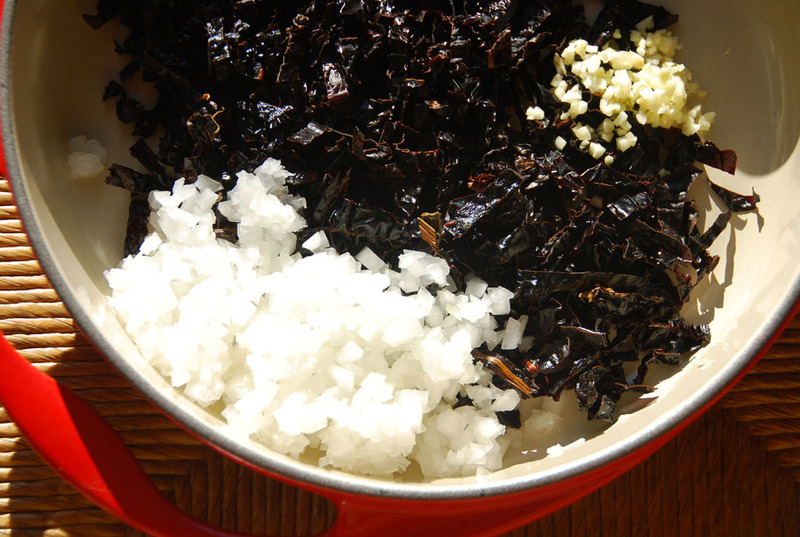 This recipe shows no amount of white rice or how much garlic. Oh you don’t put rice in this recipe…the white stuff in the pictures is the chopped up onion. And you can use 1 clove of garlic. Enjoy Laura! These pickled chiles are absolutely delicious. Tonight I added them on top of rice and black beans (made those using the instructions in your cookbook because I finally found fresh epazote at the market). SO GREAT! Pati, I saw the show where you ‘braised’ the garlic and peppers in the oil along with oregano I think, then blended everything with the other ingredients, am I correct the oregano went in the blender too? Before reading your recipe I bought pasilla chiles, too hot or will they work do you think? Thanks for the great show seen on Create in Miami. Wow! I was making Nachos for dinner and was making fresh Salsa to go on top when I found this recipe. So I made this instead. My husband loved it. He was delighted with the taste and managed to eat almost the whole jar himself! I would say this was a big hit with him! Thank you for your great site & great PBS Program. I love your stories, family & I also love how you describe the cooking process & how you make the foods you prepare sounds so delicious. I’m not a person with an adventurous pallet, but you make me want to try them! I found your show quite by accident. I started watching it during Season 6 on PBS. Season 3 is now showing. You’ve made me want to visit Oaxaca & I did decide to try the Oaxaca Cheese…delicious! I love how it melts. 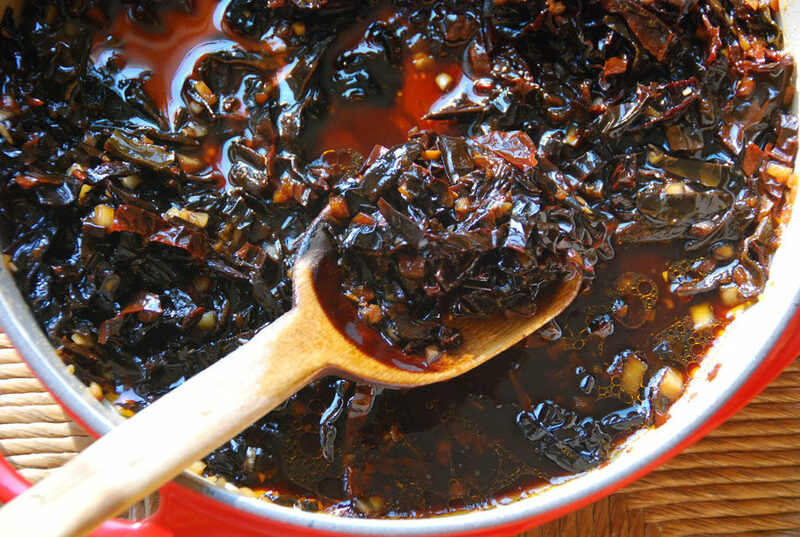 This Ancho Chile is the first recipe of yours that I’ve tried to make. 1. What type of vegetable oil did you use in the video? 2. Is Olive Oil okay to use? 3. How much vegetable oil should we use (1/4 cup or 1/2 cup) ? 4. Is the final product supposed to he liquidy? I think I may have used to many ancho chiles. The Chiles in the package were small very shriveled so I guessed how many equaled the 7 you used in the video. I just checked the Chile & it looks like the ancho chiles absorbed most of the liquid. I made this last night, it’s still in the refrigerator, I haven’t tasted it yet. After adding the ingredients into the mason jar I decided to re-view your video & noticed that on the video you said you added 1/4 cup vegetable oil. In the printed recipe it says to use 1/2 cup vegetable oil. I used 1/2 cup canola oil. But really wanted to use Olive oil, but I wasn’t sure if it would affect the final flavor. I’m so glad you discovered the show, Tyra! You can swap the vegetable oil for any type of oil you like, including olive oil. Use 1/2 a cup of oil (I sometimes tweak my recipes to make them even better after the show has aired…so go by what it says online). And yes the salsa can get pretty liquidy. I hope you and your husband love it! This salsa is great. I like to put it on a classic Chicago dog or a hamberger. It’s realy delicious on just about anything like jicama, cucumber, pineapple salad as dressing with a little a sprinkle of cilantro. So good! I agree….it goes with so much! Thanks for sharing Georgia. Can you use olive oil instead? Hi Pati, Love your show and I am trying to make lots of your recipes. I bought a big bag of dried Gujaillo peppers and wondered if I could use them in place of the ancho peppers to make this salsa? Thanks! Thank you for the link to the guajillo chile salsa but I have a question. Is that recipe and the one above using the ancho chilles are they using the dried chilies or fresh chiles? Where I live I can only find the dried versions and not sure how to use them in these recipes. Do do have any other recipes using the dried gujallio peppers so I know how to prepare them for a recipe? Thanks so much, we just love seeing your family, watching your show and making your delicious food! Oh thank you Margie! Guajillo and ancho chiles are both types of dried chiles…here is some more information: https://patijinich.com/ancho_chile/ https://patijinich.com/guajillo_chile/ And here’s another recipe with guajillo chiles….https://patijinich.com/recipe/meatballs-in-guajillo-sauce/ Enjoy! Can this be canned? I want to give as a gift, but don’t want it to spoil. Oh it lasts for months in the fridge! That’s how I keep mine good for a long time. Should the peppers be rinsed in water or cleaned? ​You can either dust them off, or rinse them off. Oh yum with Chinese food! I was introduced to this delicious salsa for the first time last night! I can’t wait to make it for myself. This salsa will be a staple in my home from this day forth. LOVE IT! Just wondering, does anyone have recommendation for complimentary dishes to serve the salsa with. I think it would be great on sandwiches and this will be my first experiment….anyone have any suggestions? I like to use it like a regular salsa to top all sorts of dishes like tacos, quesadillas, omelettes…or use it as a dip for chips. It also makes a great relish for meat, fish, and even as a salad dressing. I was wondering, do you have to use the rice vinegar? That isn’t something I buy or use. Would doubling the white vinegar or adding cider vinegar work as well? I normally don’t like veering from a recipe, but rice vinegar just isn’t in my kitchen. I would love to try this though! Hi! You don’t have to. You can just double up the white vinegar, no worries. I am totally obsessed with this salsa!!! I have been eating out of the jar!! This recipe is addictive! It’s delicious with everything. This is probably a moot question because it is quickly consumed by my family, but how long will it keep in the ‘frig? Could I can it for long term preservation or would the heat from the canning process alter the flavor? I keep it in a jar in my fridge for months! This is my new favorite condiment! I put it on everything. Even eggs! It is awesome over a goat cheese omelette… Try it! 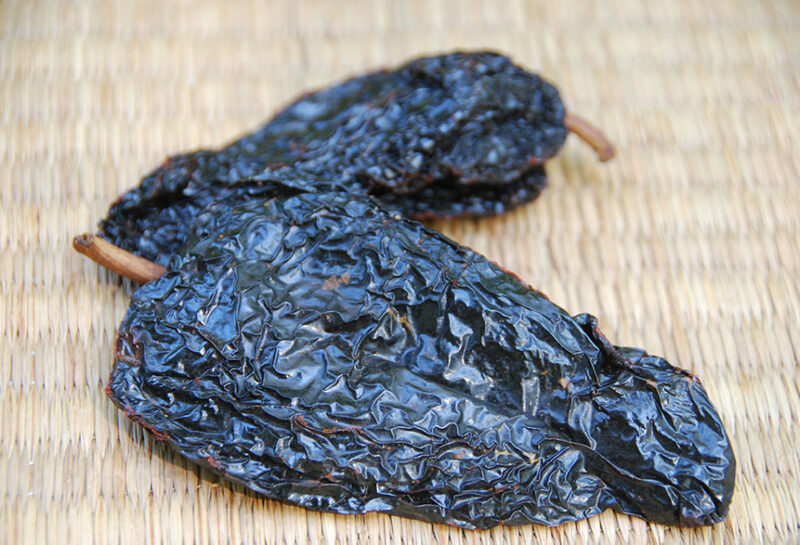 How do you clean the outside of ancho chiles before using? The seem dusty and dirty. I Have made this recipes several times now, it’s so good, but I feel like I am washing away a lot of the flavor when I am cleaning the peppers under running water. Do not worry! You won’t wash away flavor. Rinsing will work: http://patijinich.com/2009/03/ancho_chile/ =) Good luck! Hi, just saw your show for the first time today! It was the “Girls just want to have fun” show and I can’t find the recipe on this site, for the cocktail you served the ladies. Is it somewhere that I haven’t found? Oh, thank you so much!! Cannot wait to give this cocktail a whirl !! Can’t wait to make this, it sounds really yummy. Hi Pati! I love your recipes, they really help me get more acquainted with the wonders of Mexican cuisine. I have a question about this recipe, do you leave the mixture out to ferment and then place it in the fridge after 8 hours or does it go immediately in the fridge after everything is mixed together? Go ahead and pop it in the fridge right after everything is mixed. Pati, deliciosísima! Muchas gracias por compartirlo! Pati – This is absolutely delicious! Thank you. I may become addicted to it. 😉 Enjoy your show very much. All the best. Oh my goodness yes! This is delicious stuff! I can’t wait to try more of your recipes. Thanks Pati! Absolutely delicious. I can’t stop eating it. Thank you! It is SO addicting!! Thank you so much for all the great recipes and ideas on this site. I’m wondering if you can help me name/get a receta for…taco sauce. That thin, orangey-red, highly addictive stuff that comes on street tacos? Must have the secret! Hola Elle, I’ll try to post it soon! After only two weeks, I am already making a second bath of the this. My husband watched me make it and laughed at me. And then has put in on everything since then. It is so delicious! Thank you Pati!!!! Hi, no you don’t, you cut them and mix them with the rest of the ingredients, let them sit and macerate and that’s pretty much it! Thank you Pati, I look forward to making this salsa! 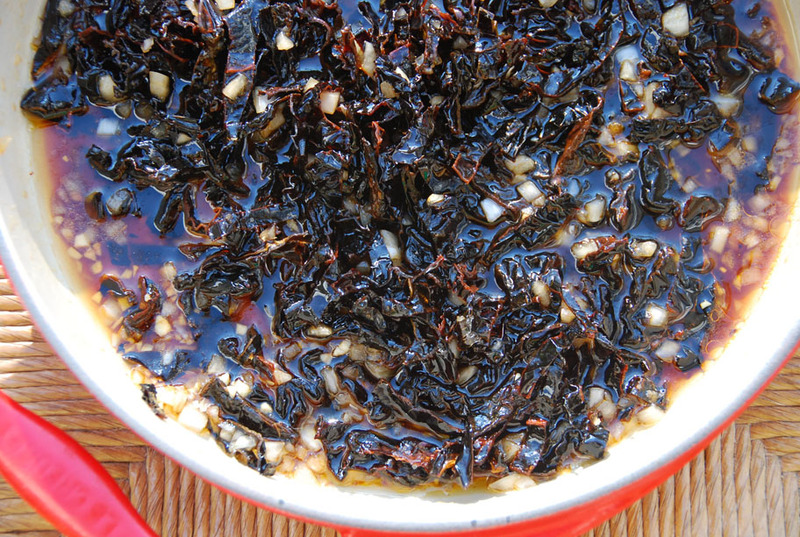 I want to try your Ancho Chile Salsa this weekend, it looks absolutely incredible! . I think my boyfriend John love this! I like also your other healthy recipe for diet. Definitely I will add this to my to-make list! Thanks for your great recipes. Good job friend! Keep updating through your cookbook. Nice post indeed. Excellent! The reason I asked what is a good dish that could compliment this salsa, is because I have been requested to bring “something Mexican” unknown around here, for a big pot luck group. I have no idea what the others are bringing since it each picked a dish from a hat, and were asked not to reveal it to each other. Hola Velia, You didn’t upset me! 😉 You can use it like a regular salsa to top tacos, quesadillas, etc., or as a dip for chips. 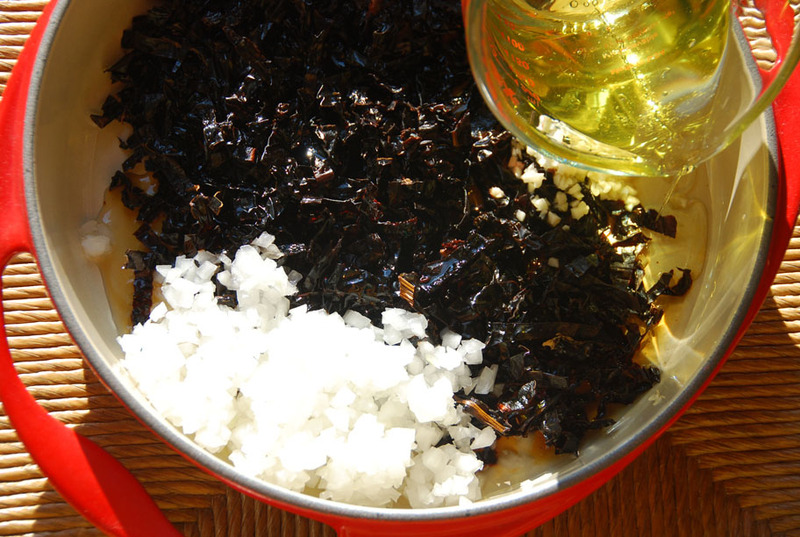 It also works great as a relish on top of meat and fish dishes, or as a dressing for salads. I’m always looking to find you on the PBS Stations around us. Keep up the good work – and good luck!!! Thank you so much, Ellie! This I’m making for sure (maybe for Memorial Day) my family loves spice. Watch you all the time on PBS. Yay! I hope everyone enjoys!! Thank you so much Pati. I love your recipes. Con que se sirve este encurtido de chile ancho? This is the best salsa I’ve made! I always get lots of compliments on it, and it can be used on anything. Easy to make and lasts a good long while too. Hi Billie, I’m so happy you made it! How much does this recipe make? Thank you. Hola Donna, About 3 cups!